How to calculate the power factor? This power factor calculator is a handy tool for analyzing the alternating current (AC) flowing in electrical circuits. You probably already know that you can model the direct current (DC) with the help of Ohm's law. In the case of AC, this task is not that simple, as such circuits contain both real and reactive power. This calculator will help you not only find out what are the values of the different types of power in the circuit, but will also supply you with a power factor formula that expresses the relationship between the real and apparent power. If you want to understand what the power factor is, you first need a deeper understanding of its components: the real, reactive, and apparent power. Real power (also called true or active power), denoted with P, performs the real work in an electrical circuit and is dissipated in resistors. It is the only form of power that appears in a DC circuit. In an AC circuit, the values of current and voltage are not fixed - they change sinusoidally. If there's no phase shift between these two values, then all of the power transferred is active. This power is measured in watts. Reactive power, denoted with Q, is transferred when the current and voltage are 90 degrees out of phase. In such a case, the net energy transferred in the AC circuit is equal to zero, and no real power is dissipated. Reactive power never appears in DC circuits; in AC circuits, it's linked to the reactance produced by inductors and capacitors. It is measured in Volt-Amps-Reactive (VAR). Apparent power, denoted with S, is the combination of the real and reactive powers. It is the product of the RMS (root mean square) values of voltage and current in the circuit, omitting the influence of the phase angle. It is also a vector sum of P and Q. Apparent power is measured in Volt-Amps (VA). As the apparent power can be found by vector addition of the real and reactive power, you can use a graphical method to represent these three values in the form of a triangle, called the power triangle. Each side of the triangle represents one of the three forms of power being transmitted in an AC circuit. The legs of the right triangle represent the real and reactive power, and the hypotenuse - the apparent power. Additionally, the angle between the real power and apparent power, denoted with φ, is the circuit's impedance phase angle. Power factor is the ratio between real and apparent power in a circuit. If there is no reactive power, then the power factor is equal to 1. If, on the contrary, the real power is equal to zero, then the apparent power is also 0. For example, a power factor of 0.87 means that 87% of the current you supply to the circuit is performing real work. The rest of the power - 13%, to be exact - has to be provided to make up for the reactive power. The three main components of an AC circuit are resistors, capacitors, and inductors. You can use this power factor calculator not only to describe the power that is transferred through each of these components, but also to establish what happens when an electric current passes through them - namely, what resistance, reactance, and impedance do such elements possess. Resistance, denoted by R and expressed in ohms (Ω), is the measure of how much does a conductor (most notably a resistor) reduce the electric current I flowing through it. This value is directly linked to the real power flowing in an AC circuit. This relation can be written as P = I²R. Reactance, denoted by X and also measured in ohms (Ω), is the inertia that opposes the motion of electrons in a circuit component. It is present mostly in capacitors and inductors. If you run an AC through a component with high reactance, the voltage drop will be 90 degrees out of phase with the current. Reactance is linked to the reactive power with the equation Q = I²X. Impedance, denoted by Z and measured in ohms (Ω), is an AC equivalent of resistance in DC circuits. It is present in all components of all electric circuits. It can be calculated by vector addition of resistance (see below) and reactance or by the formula S = I²Z. Perfect resistors have nonzero resistance, but zero reactance. Perfect inductors or capacitors have zero resistance, but nonzero reactance. All components of an electric circuit possess some impedance. 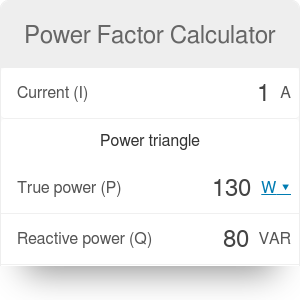 Power Factor Calculator can be embedded on your website to enrich the content you wrote and make it easier for your visitors to understand your message.